I’ve just posted a new blog to 100kGarages that highlights the Kickstarter campaign of a design company called AtFAB. AtFAB (Anne Filson and Gary Rohrbacher) is all about digital fabrication and the way that digital fabrication enables a new kind of distributed manufacturing. It’s all about how to return competitive, small-shop manufacturing to communities with good jobs and attractive life-style options. I’ve written frequently about distributed manufacturing with digital fabrication and how it supports a “new industrial revolution,” an alternative to the mass production off-shoring of our making and producing (see recent review of Chris Anderson’s “Makers: The New Industrial Revolution”; or my somewhat overly long talk TEDx talk). 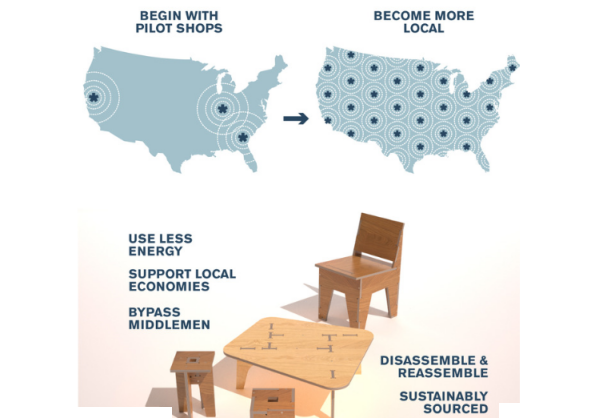 In their Kickstarter project, AtFAB takes on making the new manufacturing really happen – kicking off a return of furniture making in our own communities. They offer up three contemporary and “utilitarian” pieces of furniture to pilot the whole process. Their Kickstarter page describes the challenges that we face implementing the new fabbing technologies. It offers solutions and approaches to help make the design- fab process efficient and their own plans to try it in a few shops, before going even more distributed. It is a ground breaking effort by two designers to get manufacturing to a better place. It is a visionary proposal for delivering their designs — “moving information globally to fabricate locally”. In their presentation, Gary and Anne use their awesome collaboration with ShopBotter Bill Young on the furnishings for the New MakerBot Headquarters in NYC to show how digital fabrication of furniture will work. Included is a great video of Bill producing the dozens of pieces of furniture and cabinetry for the project. If you haven’t seen this in an earlier report, I highly recommend it. 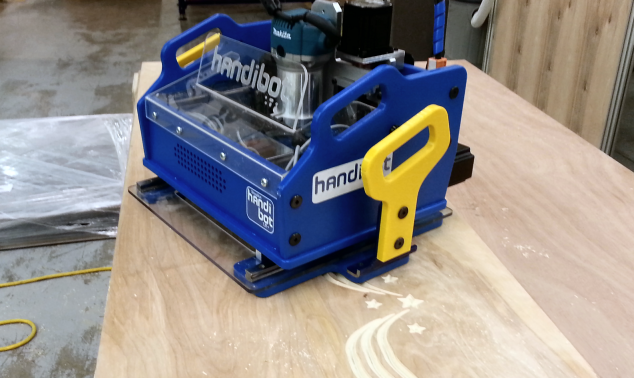 In a few days, ShopBot will begin undertaking our own new distributed manufacturing project via Kickstarter. We will be launching a campaign to produce the first few batches of our new Handibot tools and to fund the development of an application and resource ecosystem for these new “Smart Power Tools.” Our goal, if we are able to sufficiently energize interest in the tool, is to eventually distribute much of the manufacturing of Handibots to small shops around the country in the 100kGarages.com network — thus making and supporting the tools near where they will be used. Like Anne and Gary in their AtFAB project, we see distributed digital manufacturing as the technologically, socially, and environmentally appealing new way of making things. It will offer an attractive new kind of work for entrepreneurial designers and creators, and for entrepreneurial digital fabbers.